The challenge: According to UN World Food Programme, one in three children in Myanmar is chronically malnourished. 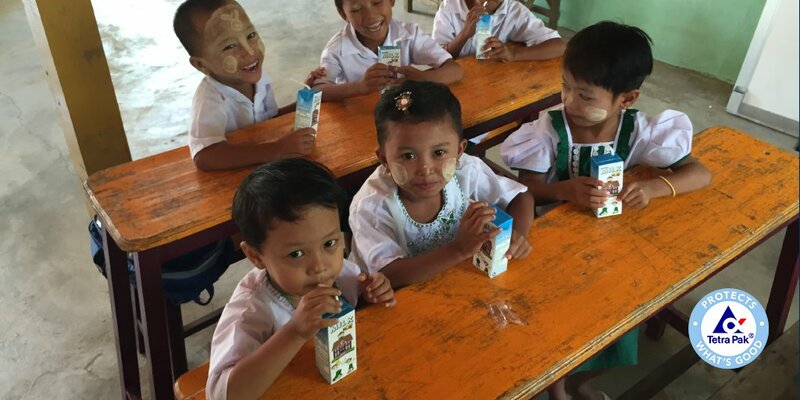 The initiative: The Myanmar School Milk Programme was launched in 2013 by the government of the Republic of the Union of Myanmar, with technical support from Tetra Laval Food for Development. The goal has been to grow the school milk programme into a nationwide programme providing every child in Myanmar with nutritious milk. Su Sanda Hlaing is the manager of the programme, now reaching 26,000 children. Her team monitors and develops the programme and maintains close collaboration with Ministry of Education counterparts. They visit each school on a regular basis and are in direct contact with teachers, parents and community representatives to assess how the milk is making a difference. Safe storage protocols, milk consumption reports, waste handling and all other safety and quality protocols are being followed to ensure that the milk is of the highest hygiene and safety standards. The value: The nutritious milk has been widely accepted by the children and the community. Enrolment and drop-out rates have improved considerably in targeted schools. The Institut de Recherche pour le Developpement is conducting a nutrition impact study of the school milk programme, which will be finalised in 2017. Looking ahead: There is an important link between school milk and the dairy sector, since the demand for milk in schools is a key market for local smallholder dairy farmers. A nationwide school milk programme would not only benefit all the children but also many smallholder farmers, in turn developing local milk production.